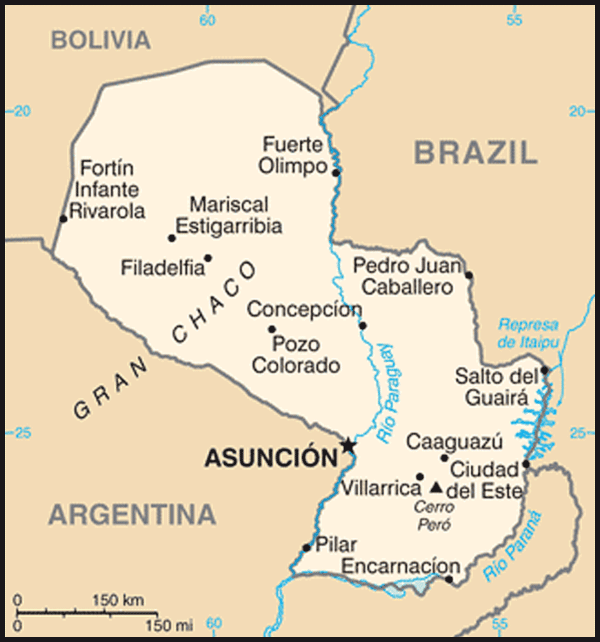 Cities: Capital: Asuncion (pop. 518,945). Other cities — Ciudad del Este, Concepcion, Encarnacion, Pedro Juan Caballero, Coronel Oviedo. Nationality: Noun and adjective — Paraguayan(s). Population (July 2011 est., CIA World Factbook): 6,459,058. Annual population growth rate (2011 est., CIA World Factbook): 1.284%. Branches: Executive: President. Legislative — Senate and Chamber of Deputies. Judicial — Supreme Court of Justice. Agriculture (20% of GDP): Products: soybeans, cotton, beef, pork, cereals, sugarcane, cassava, fruits, vegetables. Arable land — 9 million hectares, of which 35% is in production. Manufacturing and construction (16% of GDP): Types — sugar, cement, textiles, beverages, wood products. Trade (2010): Exports: $4.534 billion: soybeans and soy-related products, cereals, beef, wood, leather, cotton, sugar, apparel, edible oils, electricity, tobacco. Major markets — Brazil (15%), Uruguay (22%), Chile (12%), Argentina (12%), and the United States in 11th place with 2%. Imports — $9.4 billion: machinery and mechanical appliances; electrical machinery, equipment, and materials; mineral fuels and lubricants; motor vehicles, tractors, parts and accessories; plastics and articles thereof; fertilizers; beverages and tobacco; toys, games, and sporting equipment; chemical products; rubber and articles thereof; paper, paperboard and articles thereof. Major suppliers — China (32%), Brazil (24%), Argentina (16%), Japan (5%), and U.S. (5%). Paraguay maintains an embassy (http://www.embaparusa.gov.py/index_english.html) in the United States at 2400 Massachusetts Avenue, NW, Washington, DC 20008 (tel. 202-483-6960). Consulates are in Miami, New York, and Los Angeles. 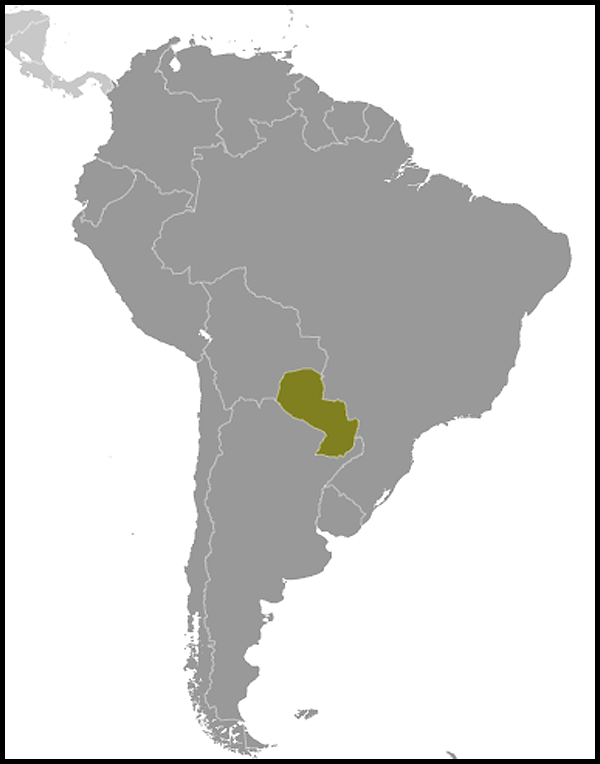 Paraguay's 2011 GDP is estimated at $21.192 billion. The economy's 2011 estimated growth rate is 5.5%. 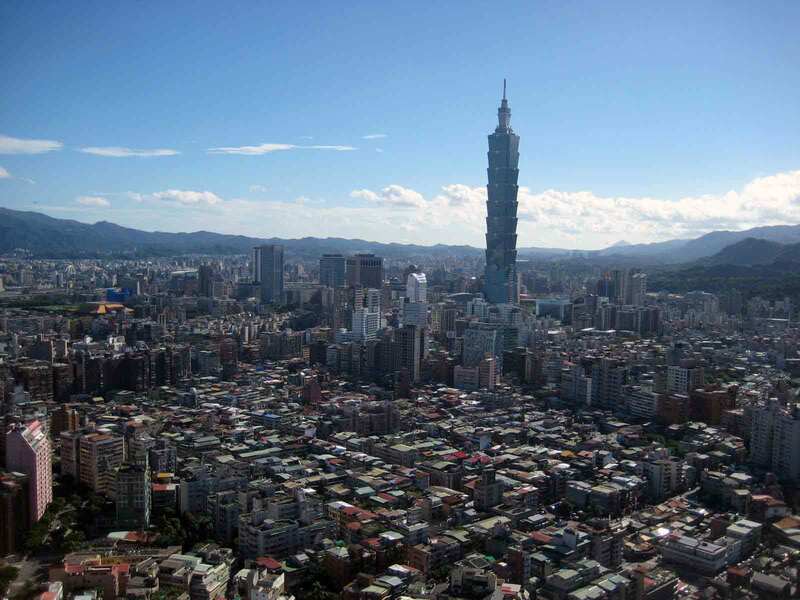 In 2010, per capita GDP increased to $2,703 from $2,336 in 2009. The account deficit increased from -0.22% of GDP in 2009 to -1.49% of GDP in 2010. In 2009, official foreign exchange reserves rose to $3.8 billion, up from $2.8 billion in 2008, and over five times the figure for 2002 ($582.8 million). As of April 2011, inflation was 4.4%, up from 2.6% in 2009, but below the 2008 level of 7.5%. According to the Central Bank of Paraguay, Paraguay's exports were $1.66 billion by April 2011. That was an 8.7% increase over exports as of April 2010. Imports as of April 2011 were $3.39 billion, a 26.9% increase over April 2010. The constitution designates the president as commander in chief of the armed forces. Military service is compulsory, and all 18-year-old males — and 17-year-olds in the year of their 18th birthday — are eligible to serve for 1 year on active duty. However, the 1992 constitution allows for conscientious objection. Of the three services, the army has the majority of personnel, resources, and influence. With about 7,000 personnel, it is organized into three corps, with six infantry divisions and three cavalry divisions. The military has two primary functions: national defense (including internal order) and engaging in civic action programs as directed by the president. The navy consists of approximately 2,000 personnel and in addition to its fleet, has an aviation section, a prefecture (river police), and a contingent of marines (naval infantry). The air force, the smallest of the services, has approximately 1,200 personnel. Bilateral trade with the United States has increased during the last 7 years, after a steady decline over several years due to a long-term recession of the Paraguayan economy. Total two-way trade between the United States and Paraguay increased by about 32% in 2010 over 2009. Imports from Paraguay in 2010 were $62.1 million, up from $56.4 million in 2009 but down from $78.4 million in 2008 and $68 million in 2007. U.S. exports to Paraguay in 2010 were $1.8 billion, up from $1.4 billion in 2009, according to U.S. Census data. More than a dozen U.S. multinational firms have subsidiaries in Paraguay. These include firms in the computer, agro-industrial, telecom, banking, and other service industries. Some 75 U.S. businesses have agents or representatives in Paraguay, and more than 3,000 U.S. citizens reside in the country. The U.S. Government has assisted Paraguayan development since 1942. In 2006, Paraguay signed a $34.9 million Millennium Challenge Corporation's (MCC) Threshold Country Program (TCP) with the U.S. focused on supporting Paraguay's effort to combat impunity and informality. A second MCC Threshold program for $30 million was approved in July 2009. Also in 2006, Paraguay signed and ratified an agreement with the U.S. under the Tropical Forest Conservation Act that provides Paraguay with $7.4 million in relief and elimination of its remaining bilateral debt in exchange for the Paraguayan Government's commitment to conserve and restore tropical forests in the southeastern region of the country. Separately, the U.S. Agency for International Development (USAID (http://www.usaid.gov/locations/latin_america_caribbean/country/paraguay/) supports a variety of programs to strengthen Paraguay's democratic institutions in the areas of civil society, local government and decentralization, national reform of the state, rule-of-law, and anti-corruption. Other important areas of intervention are economic growth, the environment and public health. The total amount of the program was $17.8 million in fiscal year 2009, and about $11.287 million in fiscal year 2010. The U.S. Department of State, the Drug Enforcement Administration, the Department of Justice, and the Department of Treasury provide technical assistance, equipment, and training to strengthen counternarcotics enforcement, combat trafficking in persons, promote respect for intellectual property rights, and to assist in the development and implementation of money laundering legislation and counterterrorism legislation. On December 19, 2003, U.S. and Paraguayan officials signed a memorandum of understanding (MOU) to strengthen the legal protection and enforcement of intellectual property rights in Paraguay. The MOU was renewed in November 2009. The United States and Paraguay discussed ongoing work under that MOU during an October 2010 United States-Paraguay Joint Commission on Trade and Investment meeting in Asuncion. The current MOU will remain in effect through the end of 2011. The countries also discussed joint work in creating opportunities for small and medium-sized enterprises in the United States and Paraguay. The Peace Corps (http://www.peacecorps.gov/index.cfm?shell=learn.wherepc.southamerica.Paraguay) has about 235 volunteers working throughout Paraguay on projects ranging from agriculture and natural resources to education, rural health, and urban youth development. 2007 marked the 40th anniversary of the Peace Corps in Paraguay. The Office of Public Diplomacy also is active in Paraguay, funding Fulbright and other scholarships to the United States, U.S. scholars to Paraguay, other short- and long-term exchanges, English scholarship programs, donations of books and equipment, and a cultural preservation project to restore Paraguay's National Library.